WordPress is one of the most widely used blogging platform all over the world. Recently a popular news magazine reported that a large number of websites are hacked each year and greater percentage of those hacked websites run on WordPress platform. I’m a WordPress lover and it is really disappointing to know such facts and stats. If you are a WordPress user then I’m sure you must have ever tried to change unchangeable WordPress username. And yes, all your attempts comes to end with disappointment after knowing that default WordPress usernames are unchangeable and they can’t be changed. But yes, you need to change unchangeable WordPress username in order to make your WordPress site more secure. Because everyone knows that by default any WordPress site has “Admin” username. So it becomes easier for hackers or intruders to get access to your admin panel as they are already knowing your username. Thus,all they need is that lucky attempt of right password and you loose access to your own website. Yea, its heart-breaking to loose your all hard work only to the hands of some clever hackers. Because once hacked, you can’t really do anything other than regretting. 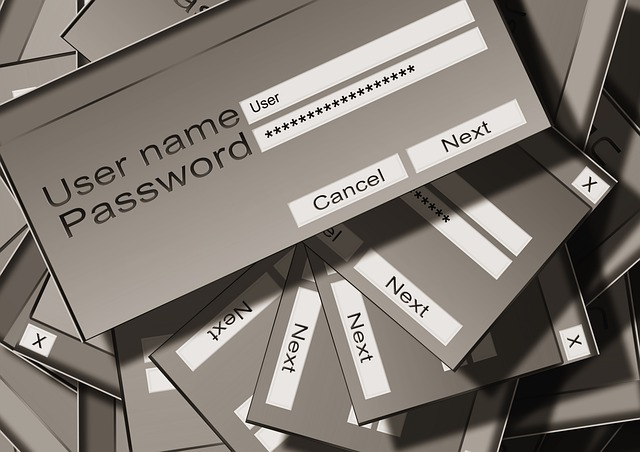 So its wise idea to change unchangeable WordPress username and make your admin panel more secure. Therefore today, I’m sharing these “3 simple tricks to change unchangeable WordPress username easily“. To change unchangeable WordPress username using phpMyAdmin, you don’t need to have admin access to your WordPress site, neither any plugins nor any other services are required. All you required is access to your FTP cPanel. So do you remember your cPanel username and password provided by your web hosting service provider ? It’s enough ! If not, try to recall them. First of all, login to your wesite’s cPanel using FTP username & password. Your website’s cPanel can be found at yourdomain.com/cpanel [Replace yourdomain with your domain name e.g – techreviewpro.com/cpanel]. Now be a good “Googler” and find out your phpMyAdmin area. Your phpMyAdmin area can be found under databases section as shown marked by Green arrow below. Click on it and it would launch your phpMyAdmin area. Where you can find various MySQL databases of your website in left sidebar. 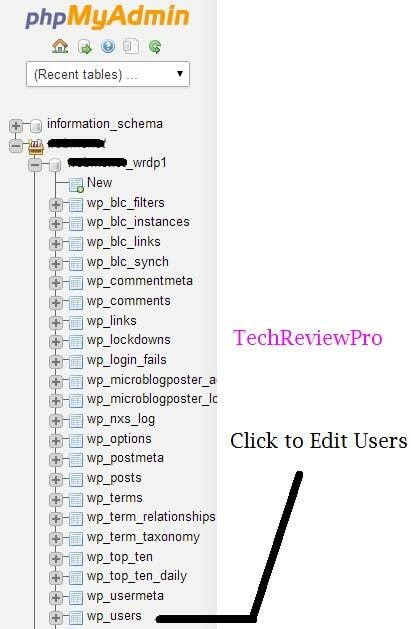 As you click on “wp_users” you will see a number of users available in your website’s database. Simply click on edit and edit information of desired user as shown below. After editing, click save and you are done ! Now login with newly given username and password. Thus, in this way you have successfully changed your WordPress username. Above listed method is quite techy and if you are someone who don’t know these technical stuffs, I have one more way to help you change unchangeable WordPress username. WP-optimize is one such plugin that let’s you change your default admin username easily. To make it more simple, let me tell you after installing WP-Optimize plugin go to security setting and in old username field, enter your old username i.e. Admin and in new username field enter you new desired username. Click on Process and you are done ! That’s how simple it is ! All the above listed method are for tech users who have somewhat technical know-how. But now I’m going to share that method which I myself used and this might be much more beneficial for so called “newbies”. You don’t need access to your FTP cPanel. Even it doesn’t matter at all if you don’t have knowledge of terms like FTP, Databases, MySQL, php etc. All you need is to have access to admin panel of your site. Add a new user with your desired new username. Assign that new user admin rights. Now login using new username and password. Delete old user and don’t forget to attribute all posts, comments etc. to your new username. That’s it ! You have got success in your journey to change unchangeable WordPress username. So now, enjoy a safe and much secure login to your WordPress site. Changing default WordPress username is must. If you haven’t changed yet, its high time to make your site more secure. Also I would recommend you to keep changing your password regularly so that it can’t be guessed by anyone easily. Hope these tricks would help you to change unchangeable WordPress username. If you encountered any problem using these tricks then must let me. Also let me know which method you prefer via comment section below. Glad to visit your blog again and I am very happy after reading your post. I was literally sick and tired due to unable in changing the WP username, but after reading this post I am going to change the WordPress user name as now as I want to start a new project on it. Sincere thanks for the helpful post. Its my pleasure that my post helped you. And really its an awesome feeling to see you back. However all the best for your next project. By the way you didn’t tell which method you preferred ?? Basically, I must focus on quality and unique content and actually I am learning from your post. Thanks for your kind feedback. There is nothing pleasant than hearing these words that my tricks are helping you. By the way out of the 3 listed above which method you prefer ? I will prefer number three option, because there is no coding and plugin needed to perform this task. Simply by adding new admin i get better security!